Only about one-third of U.S. workers are engaged at work -- and that figure has barely budged in more than a decade. Worse, just 13% of employees worldwide are engaged. These figures should be concerning to business leaders and anyone else who worries about the state of the American and global economies. Companies everywhere have opportunities for greater productivity -- and are leaving money on the table. Gallup's latest meta-analysis shows that business units in the top quartile of employee engagement are 21% more profitable, are 17% more productive, have 10% better customer ratings, experience 41% less absenteeism and suffer 70% fewer safety incidents compared with business units in the bottom quartile. Nonetheless, Gallup research suggests that setting clear expectations may be the most foundational element. Only about half of all workers strongly indicate that they know what is expected of them at work. Expectations -- or a lack thereof -- have the power to make or break worker engagement. Even if employees feel energized and motivated, those who lack clear expectations and spend too much time working on the wrong things can't advance key initiatives to create value for an organization. The desire for clear expectations is a shining example of a shared need across generations, from millennials to traditionalists. All workers, regardless of age or stage in their career, want to know what's expected of them in the workplace. And the lack of clear expectations can cause anxiety and confusion in workers. Developed collaboratively. Companies need to get workers' input, collaborating with them to agree on role expectations. With this approach, workers will be more likely to own their expectations and succeed. Articulated clearly. Managers shouldn't make workers guess. With each employee, managers should talk openly about expectations and be crystal clear about what they expect. Aimed at excellence. Workers aren't inspired by minimum job standards such as showing up on time or submitting time sheets using the proper process. Instead, managers can bring out the very best in each worker by talking about what top performers do differently and then setting expectations based on those best-in-class behaviors. Individualized to strengths. Employees do not want to spend the majority of their time on tasks they lack interest or proficiency in. When managers help workers better understand what comes naturally to them -- their innate strengths -- and then position them to use those talents more at work, employee performance and engagement both skyrocket. When it comes to building employee engagement and accelerating business outcomes, focusing on strengths is one of managers' sharpest tools. After zeroing in on the right targets with clear expectations, managers can unleash employees' greatest performance by focusing on their strengths. 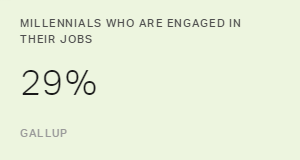 Just 29% of millennials are engaged in their jobs. They'd be more committed if they received job clarity and were held accountable for their performance. Helping employees set and achieve goals is a manager's key responsibility. But many managers don't really own this task.